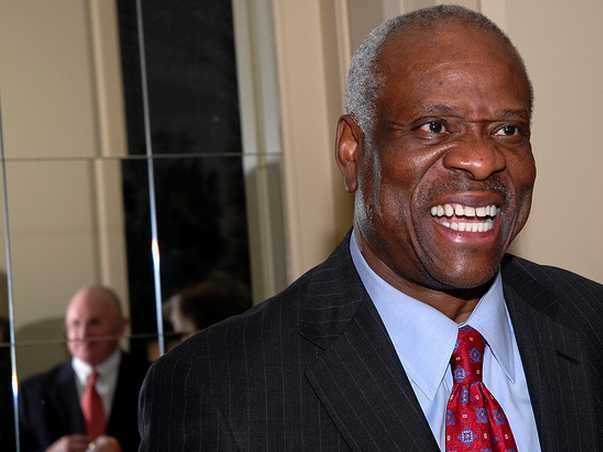 Supreme Court Justice Clarence Thomas made headlines in January when he spoke for the first time in nearly seven years, but he wasn’t actually asking a question. (He was cracking a joke about Ivy League schools. )However, it seemed like Thomas might actually ask a question Wednesday when the high court heard a challenge to the Voting Rights Act of 1965, a landmark civil rights law. He’s a famous opponent of affirmative action. And in a previous challenge to the VRA, Thomas wrote a dissent saying the discrimination that necessitated the law in the first place “no longer exists,” USA Today reported. But he didn’t ask a single question on Wednesday, as always. Why would a justice of the nation’s highest court remain totally silent during an argument about an issue he’s obviously really passionate about? Thankfully, Thomas hasn’t been completely mum on why he asks no questions. At an event in North Carolina in June, Thomas said he’d get rid of oral arguments if he could, which sheds some light on why he might not be such an eager participant in them. Other clerks at the Supreme Court also didn’t hold Thomas’ silence against him, according to Wexler. They took Thomas at his word that he just didn’t think questions were all that helpful.